Stylish Ocean Front Condo - A Stone Throw Away! Allow the sound of the waves to relax you as you enjoy a beautiful condo with all the modern amenities. High end appliances throughout. Modern decor professionally accessorized by Swan Interiors. Enjoy all the modern conveniences; free high speed wireless internet, free long distance calling to the Mainland and Canada, high definition cable Plasma TV and apple TV. Bring your own Ipod or Ipad to wake up to or listen to your own music during your stay. If you are looking for a stunning modern condo that has it all look no further! Spectacular bathroom with a glass tiled shower and unique glass sink. A 5 minute walk to Sugar Bech, said to be the longest beach on Maui. Also known as Kealia Beach - it is perfect for a long beach stroll. This sandy shoreline stretchs for about 2.5 Miles. Listen to the sound of the surf on your lanai. Waves lapping at the shore off the lanai with stunning views of Haleakala from the morinig sunrise to spectacular colourful sunsets. Cross Fit Maui in the Maalaea Shops is a full workout facility and offers weekly and monthly rates for guests. French doors with filtered water dispensor and bottom drawer freezer with ce maker. Glass top cook top with a warmer drawer below the oven. Sophie Conran dishes and serving platters and bowls. High end appliances, granite counter tops, and all the amenities any chef would appreciate. Pull up to the gorgeous counter granite island and feast away. Assigned underground parking stall, Elevator, Modern fully equipped kitchen with granite counter tops and high end appliances. Sophie Conran dinner ware. Stunning Ocean views second to none of the Pacific Ocean, Haleakala, Kihei, and Molikini. Views to die for! Whale and turtle watching on the comfort of your Lanai while dining and a short walk to miles of sandy beach. All the beach gear you could need. 2 beach chairs, a beach umbrella, portable cooler, ice packs and even a beach bag to make your stay enjoyable. Great condo with a perfect view of the water. Everything we needed was there and then some. We loved staying at Carey's condo. It was so nicely appointed and lovely. We had everything we needed and then some. One of the best points about staying in Maalea was the location. Not too far from Kihei for groceries and definitely quiet and out of the Lahina-type traffic. The view from the deck is beautiful and the place is so quiet we didn't even notice if there were other people staying in the complex. Very comfortable and definitely high-end. Thanks so much for a great time. This is a beautiful modern condo. Views are spectacular across Maalaea bay. You can see the Observatories atop Haleakala on a clear day. Humpback whales breaching and tail slapping. Giant sea turtles splashing and playing in the waters that lap against the seawall. Its a short drive to Lahaina or around the bay to Kihei. Maalaea is the windy side of the bay, this keeps it cool with a fresh breeze blowing through the condo day and night. Sugar beach is a short walk down Hauoli Street. Sugar beach wraps all the way around the bay to North Kihei, about 2.5 miles. It is a short 3 - 5 minute walk to the Aquarium. The aquarium has a spectacular new 3d humpback whale show. A must see. Great restaurants abound on Maui. The condo was super clean, every modern appliance you could want. Carey was very helpful with any questions I had. This was our first visit to Maui. Great location! This low rise building (Unit 405) has great views of the ocean, especially morning sunrises! The unit design is well thought out. The kitchen is well equiped, living room and bedroom furnishings are new and comfortable. In the evening in the distance you see the lites across the bay from Kihei which quite nice. We really enjoyed our stay. The weather was not great during our 5 days in Maalaea and we were thankful we had chosen a comfortable place since we spent a lot of time inside. The condo is very well appointed and thought out. We enjoyed being able to walk to the small stores at the ocean center for a snack or quick meal. The location was central to just about any town you would want to visit. Thanks again! Overall, this location and the condo are wonderful. The owners have thought of everything and are very quick to respond to any inquires or questions. The unit is very well taken care of and makes your stay very comfortable and relaxing! We have stayed twice now and would come again!! It’s such a wonderful place in paradise!! 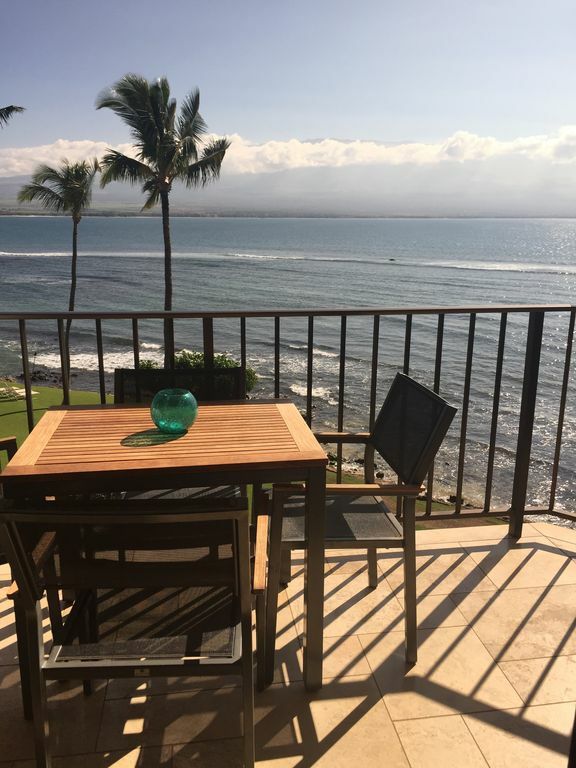 Situated right on the Ocean at Ma'alaea, just minutes away from the harbour in a quiet building located centrally to all of Maui's great beaches and vacation destinations. Enjoy watching turtles frolick in the waves and the humpback whales during whale season all from the comforts of the lanai. Within walking distance of the longest beach on Maui, the Maui Ocean Center, Maui Golf & Sports Park, Ma'alaea Shops and Restaurants. Other Activities: ocean excurisions, shopping, kayaking, boating, miniature golf. * Blue Water rafting is highly recommended (is a snorkel trip) if you like to snorkel! * Taking the ferry from Lahaina over to Lanai, then taking a private 3 hour Land Tour from Baccara ($75/person), or renting a Hummer, and have lunch at the Four Seasons over looking the beach, snorkel and explore around the private beach and then head back on the Ferry in the late afternoon. You will see schools of spinner dolphins and flying fish. * Go and spend an afternoon watching the kite, wind and body surfers just past Paia, as well as the sea turtles napping on the beach and swimming in the calm pools. * Go and snorkel at Black Rock in Kanapali near the Hilton and then have lunch or go browse the shops at Kanapali. * Go to the swap meet on a Saturday for local produce, tshirts, hawaiian made jewelry,etc. A few restaurant suggestions for you if you are going to be eating out at all. - Best meal we have ever had (expensive but worth it) is at the Four seasons Wailea at Spago's - go before sunset and ask for a table overlooking the ocean. Pacifico's in Lahaina is second. - Go and have lunch in Paia at the Fish Market or Flat Bread restaurant. I am also attaching additional information about the Farmers Market where you can get local produce at reasonable prices. $195 U.S. per day peak season and $175 U.S. low season. Smoking and Pets Not Allowed: Cleaning fines will apply if smoking occurs in the unit or on the lanai. Until confirmed, rates are subject to change without notice.